John 11 tells an amazing story about Jesus. When He was nearing the end of His ministry here on earth (which never ends... but that's another post) He demonstrated His power so there would be no doubt. The Jews doubted His claim that He was the Son of God. They thought He was a madman and that His very presence would make the Romans come and take away their place and their nation. Jesus had some friends, Mary and Martha and Lazarus, that lived in the village of Bethany, about two miles from Jerusalem. Lazarus got sick. Jesus knew Lazarus would die. He said, "This illness does not lead to death" because He knew that He would raise Lazarus from the dead. He'd already done so - raising Jairus' daughter- but she had just died. This time, it would be a greater miracle. This time, there would be greater glory. So He didn't rush to help. So He went to a dangerous area, a place so full of hatred for Him that the disciples thought they'd die there. Jesus stayed away, and because of that the sisters lost their beloved brother. Jesus stayed away, and they felt unimaginable pain and grief and sorrow. Sometimes, the most loving thing is to stay away. Sometimes the most loving thing is to not rush in and fix things. Sometimes, love looks like unimaginable pain and grief and sorrow. When Jesus got there and spoke with Martha, then Mary, hearing their pain and seeing their grief, He wept. The Lord of the Universe was a man of sorrows, acquainted with grief. How human we are! How sinful! We read the Word of God and believe it. Then the trials come...and we fret and worry and act as if Jesus is not all-powerful. It's one thing when unbelievers want to squelch the truth and deny the power of God, but when believers act as if all is lost, that is far worse. Help us to act as if we truly believe what You DID TELL US...that You are the Resurrection and the Life, and that everyone who lives and believes in You will never die. We will not die of a broken heart. We will not die of stress or sorrow. We will not die of pain or loss, because You are enough. We walk by faith in the Son of God. We walk, knowing that our life has purpose - a purpose to glorify our God. Virtue - this is the ability to perform heroic deeds of excellence. Like the Olympic athletes, ignore fatigue and discomfort, and press on in spite of incredible opposition and unending pain. Knowledge - diligently study the Scriptures in order to understand and apply the truth. The athletes study their craft, watch videos, observing the competition, seeking information from trainers in order to perfect techniques to gain a hundreth of a second. Self-control - literally, "holding oneself in". Restraining and disciplining oneself in spite of temptation to let go. Steadfastness - Patience in doing what is right. Endurance with hope. No matter what the obstacle or the result of competition, the athletes strive to do better, hoping that next time they'll win the prize. This is not simply hanging on with resignation...there is a looking for results involved. Godliness - reverent, loyal, obedient toward God. Brotherly Affection - Mutual sacrifice for one another. The team sports are a great illustration of this quality. Winning teams are made of those who are not "glory hounds", but are willing to sacrifice for one another in order to win the prize. Love - Putting another's good ahead of one's own desires in spite of being treated unkindly, ungraciously, or even with hostility. Love covers a multitude of sins, and we ought to always be ready to forgive one another. This does not mean that we never hold another person accountable for their actions and their need to repent. However, Love is patient and generously gracious. Love is devoted to the truth in everything. 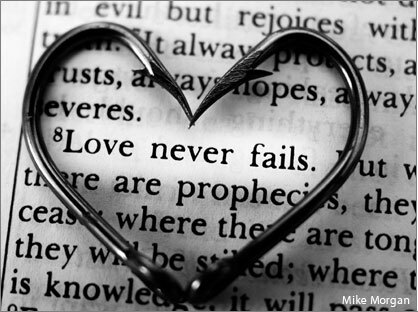 Love protects, believes, hopes and endures. It is not arrogant or rude. It never wants its own way.